The uptown blues classic Trouble Blues is the biggest hit of the spring and summer spending fourteen weeks atop the newly christened R&B Charts and offering a worthy alternative for those who were not in tune with the younger and more reckless rock artists who were otherwise taking up the most spots on the charts. For Charles Brown it was also vindication after his long tenure as the pianist, primary songwriter and lead singer of Johnny Moore’s Three Blazers came to an end a few months earlier after Brown had grown tired of receiving secondary credit to the group’s leader, guitarist Johnny Moore. Though the group was a vital proponent of the cocktail blues style which sprang up in the 1940’s with Brown serving as the featured attraction and had scored with a string of classic sides including such landmark recordings as Drifting Blues and the holiday standard Merry Christmas, Baby, Brown earned far less money than Moore who controlled the group’s contracts. After scoring with his solo debut in the winter proving that he wasn’t reliant on Moore to attract audiences, Trouble Blues bettered that and its success guaranteed him the recognition he deserved. In some ways though not much had really changed other than the accreditation as Brown had taken bassist Eddie Williams with him from The Three Blazers, though Williams continued playing with Moore for years as well as starting up a rock combo he put together at the same time he joined Brown in his solo venture. Ironically in the future Moore’s group would record with Brown again on occasion, only now the credits would read Charles Brown (with Johnny Moore’s Three Blazers) and while history has given a fair amount of recognition to Moore’s group it was Charles Brown and not the others who was inducted into The Rock ‘n’ Roll Hall Of Fame in 1999, the year of his death. 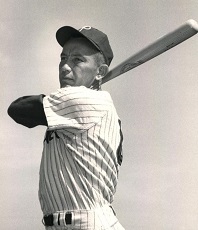 Philadelphia Phillies first baseman Eddie Waitkus is shot by an adoring female fan who’d had a crush on the player for years when he played for her hometown Chicago Cubs. Ruth Ann Steinhagen had never met Eddie Waitkus before but her ongoing proximity to him, watching and listening to his games, reading about him in the newspaper, meant she could project him into her fantasies without much trouble. But when Waitkus was traded to Philadelphia for the 1949 season her obsession no longer had an outlet and she decided that if she couldn’t have him nobody would. She paid a bellhop five dollars to deliver a note she’d written asking to meet him over a matter of some “importance” at the Chicago hotel where the team was staying when they came to town to play the Cubs. When he went to see her she shot him with a rifle, the bullet ripping through his chest, narrowly missing his heart. She calmly reported her crime and was found holding his nearly lifeless body when the police arrived. 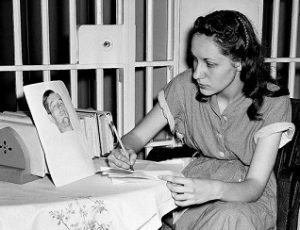 Steinhagen was elated that she had followed through on her promise, saying, “I had to shoot somebody. Now I feel relaxed”. She was declared mentally ill and committed to a hospital, while Waitkus underwent four surgeries to save his life. Waitkus, who’d been an All-Star the year before was named to the All-Star team again the following month, though more as an honorary figure since he was unable to play, though he eventually recovered and played six more rather non-descript years. The incident was among the first celebrity stalking cases on record, making headlines across the country and would in part inspire the Bernard Malamud’s 1952 novel The Natural, which later was made into a hit movie in 1984 starring Robert Redford. Captain Video And His Video Rangers premiers on the DuMont television network. The program was filmed on a shoestring budget of $25 a week and used props that were often made out of items laying around and then covered in tin-foil and given fancy names – The Opticom Scillometer – and consequently the production values were non-existent as evidenced by the fact the robot character TOBOR was called that only after the stencil reading ROBOT was accidentally applied backwards! The DuMont network’s studio was located inside Wanamaker’s Department Store which had a large auditorium they used for their sound stage that had a balcony all around it which was open to shoppers who’d look down on the shows as they were being made. Each program’s set was laid out side by side with no walls or even much space separating them and some would be setting up or rehearsing as another show was being aired. Since television was all broadcast live this caused some interesting problems, such as when a baby elephant that was scheduled to appear on a program later in the night began to loudly trumpet in response to his trainer as Captain Video was on the air. In the midst of a scene a startled Captain Video stood up in disbelief upon hearing the elephant and asked, “What the hell was that?”, forgetting he was on the air. The teenage boy who played his sidekick Ranger remained in character and replied, “I don’t know Captain, but sit down, it could be dangerous!” and they continued on as if nothing had happened. 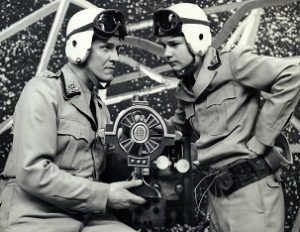 In spite of the low quality of sets, hammy acting and nonsensical plots featuring scientific gibberish scattered liberally throughout the dialogue Captain Video was the struggling network’s most popular show, airing five or six nights a week at 7PM as the lead-in for their prime time lineup, attracting a legion of young fans. Because the show was filmed live there are only 24 surviving episodes known to exist out of the more than 1,500 that aired during its long run which ended in 1955. Its lingering notoriety in spite of its unavailability in syndication in the years since is largely due to an episode of The Honeymooners in which childlike sewer worker Ed Norton rapturously watches an episode – to the consternation of his friend Ralph Kramden – while wearing an official Captain Video space helmet (one of the many tie-in products available for the show at the time). 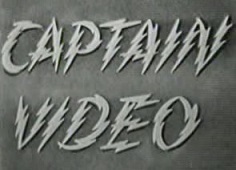 Thought of by many as being the epitome of cheap generic television programming that populated the airwaves in TV’s early days Captain Video actually was one of the most influential shows in history, watched by a generation of future storytellers whose love of science fiction started with this innocuous program. A more sobering space drama plays out in real-life as Albert II, a rhesus monkey, is killed shortly after becoming the first mammal in space having been launched by the United States 83 miles into orbit aboard a V2 rocket. The short but momentous trip ended when the parachutes failed upon re-entry. 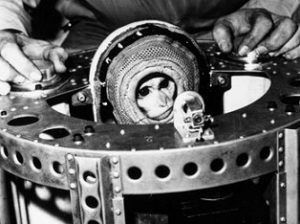 Undeterred by Albert’s tragic fatality the U.S. pressed on to further explore the possibilities of space travel provided humans didn’t have to be the guinea pigs… err, rhesus monkeys… by risking their own lives in the process. Human beings DID however insist on getting all of the scientific and financial credit along with the accompanying glory for their minor roles in these explorations while denying the primates modest request for frequent flier miles to cash in for their risking their lives for mankind’s selfish benefit. Los Angeles gets its first parking meters as the city government works to pad their expense account funds by strong-arming its citizens into paying for the right to park their automobiles on public streets. The first week of their use offending motorists would get only warnings for failure to pay as they got used to the strange contraptions, but the following week they’d be ticketed for failing to deposit five cents for an hour’s time. 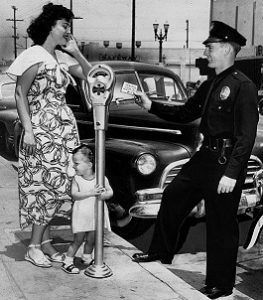 The first parking meters in the nation had been installed in Oklahoma City in 1935 and many other cities followed over the next decade, but Los Angeles had voted down such drastic measures to curb free roadside parking three times over the previous eight years until the problem became too serious to overlook… or the potential income became too enticing to resist. Nineteen Eighty Four is published introducing the terms “doublethink”, “Big Brother”, “Thought Police” and “Two plus two equals five” to indicate the changing of the truth to suit ones needs, all of which soon passed into common usage. The novel is oppressively bleak and follows the main character Winston Smith as he attempts to fight this forced conformity in the confines of his own mind, knowing even that internal “thoughtcrime” will end with his being captured, as in this dystopian world there is no possibility of escaping detection. 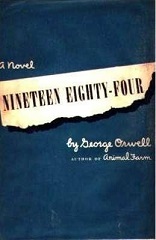 Since the outcome is not in doubt Orwell uses that foreboding knowledge to close the walls in on the reader, sustaining a mood of quietly menacing paranoia throughout the text, ultimately leaving everyone with the same sense of hopelessness and despair that exists for all mankind in the land of Oceania, the novel’s fictitious setting. Haunting images of living with an all-encompassing fear, a forced rigidity of thought and a complete distrust of everyone and everything, including even your own memories, stay with the reader long after the book is over. In spite of the discomfort one has while reading it Nineteen Eighty Four is a grippingly powerful experience and as such has been near the top of every respected survey of the greatest books ever written. Its enormous influence extends into real-world issues of the many themes touched on in the story, from Nationalism, Totalitarianism, Censorship, group-think and widespread surveillance, making it one of the most far-reaching novels ever published. Racial tensions erupt on June 21st when the city of St. Louis opens the community’s public swimming pool – the largest such pool in America (440 ft. wide) which held thousands of swimmers – for all of its citizens, regardless of race, for the first time. 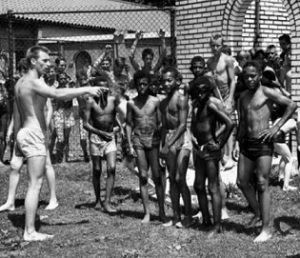 An estimated 30-40 black children swam without incident alongside hundreds of white kids until a crowd of white vigilantes armed with bats, sticks and clubs arrived to taunt the black children through the fence. Police arrived and rather than arrest the unruly mob, or even clear them from the area, they instead escorted the black children into the changing rooms and then had them leave the grounds entirely where without protection they were besieged by vile taunts, women spitting on them and men threatening them with weapons. By early evening thousands of angry whites were swarming the area, attacking any black resident who came into view, hurling bricks and vowing to murder those guilty of integration. It took 400 officers until after midnight to fully disperse the crowd, but not before ten black children were hospitalized in the brutal attack. The disgraceful incident became known as The Fairground Park Riot yet typically only seven people were arrested and four of them were black and merely trying to defend themselves against assault and battery with deadly weapons. Not surprisingly the courts were no better than the police when it came to dispensing justice as three of the four who were ultimately charged with actually inciting the riot were black, as the district attorney apparently felt “inciting” meant peacefully swimming in a pool legally open to all citizens. The St. Louis mayor responded to the atrocity by promptly rewarding the white terrorist actions and re-segregating the pool. Lux Radio Theatre is the most popular radio program for the just completed 1948-49 season, earning a 28.6 Hooper rating. The show was a staple on radio for two decades beginning in 1934 and over the years attracted a who’s who of major film stars who recreated their roles from their famous motions pictures which made up the bulk of the episodes. The film scripts would be condensed to an hour, naturally focusing primarily on the dialogue, giving audiences a different experience than they’d have gotten watching the movie in theaters. Often the films chosen had been released years earlier and so this gave the actors a chance to revisit the parts in a format that wouldn’t give away the aging they’d undergone since the movie had come out. In the days before home video the Lux Radio Theatre was about the only way for audiences to experience a classic film after it had left movie theaters. With the advent and popularization of television the radio program slowly lost its appeal, though it remained on the air until 1955. A television version called Lux Video Theatre would appear a year from now, taking the same premise but recreated live in front of cameras. With summer’s arrival now is the time to check out the extensive line of Cool-Ray Sunglasses which not only offer complete protection for your eyes but are smart looking and flattering for every face they adorn. 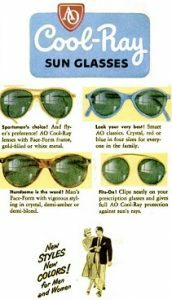 The American Optical Company which manufactures these stylish accessories for outdoor fun remind you that you’re only entitled to one pair in your lifetime – one pair of eyes that is – and their skilled craftsmen have been working 115 years on perfecting these glasses for your benefit. They boast of having the right filtering to guard against ultraviolet rays, the right centering to protect your eyes against fatigue, the right curvature to minimize annoying reflections and the right grinding and polishing to eliminate irregularities. With a wide selection of styles and colors available ranging from $2.50 to $10 you too can Play It Smart In The Sun!